Most sidestriped shrimp are caught by trawlers, not pots. Sidestriped shrimp are slender, pinkish-orange in color, with white stripes running lengthwise on the body. They can reach about 208 mm (8 inches) in length. 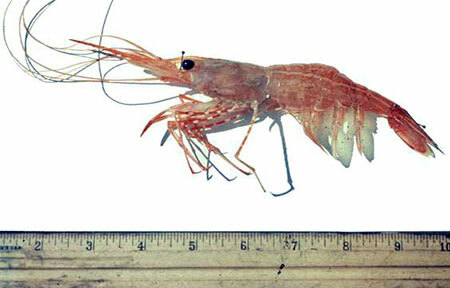 Sidestriped shrimp also have extremely long antennae (1.5 times body length) compared to other Alaska shrimp species. Sidestriped shrimp are members of the Pandalid shrimp family. Most Pandalid shrimp mature to be male. They usually mate one or two seasons as male, but later transform into female. Sidestriped shrimp reproduce in the fall, though this may vary. Eggs hatch in the spring. The larva are very small and free-swimming, but are at the mercy of ocean currents. They feed on plankton, grow rapidly and molt frequently. Finally, the shrimp has its last larval molt and looks like an adult shrimp only small. These juvenile shrimp sink to the bottom. The mature female sidestriped shrimp molts into a special shell, built for carrying eggs. A male shrimp grasps the female and deposits a sperm packet on the underside of the female. The female extrudes eggs, which are fertilized as they pass over the sperm packet. Tiny hair-like structures on the female’s abdomen (setae) hold the eggs in place until hatching in the spring. Larval shrimp feed on plankton. Juvenile and adult shrimp are opportunistic in their feeding habits. They will eat worms, diatoms, algae, smaller invertebrates, and dead organic matter. Fish (such as cod, pollock, and salmon) and humans are the main predators of sidestriped shrimp. Shrimp migrate seasonally, but most of their movement is vertical, within the water column, on a daily basis in order to feed. Sidestriped shrimp live in the northeastern Pacific Ocean, ranging from the Bering Sea to northern Oregon. Sidestriped shrimp are ocean bottom dwellers, living from 45 to 640 meters (150 to 2100 feet) deep. They prefer soft muddy bottoms. The status of sidestriped shrimp populations is unknown. 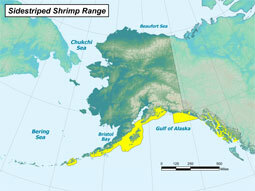 Commercial shrimp harvest in Alaska peaked in 1976 at 129 million pounds that season. Annual trawl harvests are now far below historical levels; indicating a downward trend in shrimp populations. Potential threats would be loss of habitat, offshore oil spills, global warming. Eggs fertilized externally and remain with the female until hatching.